The Volkswagen Jetta is a small family car, produced by German automaker Volkswagen Group for the Volkswagen Passenger Cars marque since 1979. Positioned to fill a saloon/sedan niche above the firm's Golf hatchback offering, it has been marketed over five generations variously as the Atlantic, Bora, City Jetta, Jetta City, Fox, GLI, Jetta, Sagitar, and Vento. The Jetta was originally adapted by adding a conventional trunk to the Golf hatchback, and some distinctive styling (usually the front end, and sometimes slight interior changes). It has been offered in two- and four-door saloon (sedan), and five-door estate (station wagon) versions - all as five-seaters. As of 2005, over 6.6 million cars have been sold worldwide, over one-third in the United States alone. Since the original version in 1980, the car has grown in size and power with each successive generation. The Jetta nameplate is a reference to the Atlantic 'jet stream', reflecting the period in Volkswagen's history when it named its vehicles after prominent winds. These also included the Volkswagen Passat (after the German word for trade wind), Volkswagen Bora (after bora), and Volkswagen Scirocco (after sirocco). The sixth-generation Volkswagen Jetta, known as the NCS (New Compact Sedan) during its development, was announced in the North American market in June 2010. The new model is larger and cheaper to produce than the previous Jetta making the vehicle more competitive against rivals such as the Toyota Corolla and Honda Civic as part of Volkswagen's goal of reaching sales of 800,000 units in the North American market by 2018. Production of the vehicle is at Volkswagen's Puebla, Mexico, facility. Although no longer sharing any body panels with the Golf and having a longer wheelbase, this model is partly based on the same PQ35 platform. 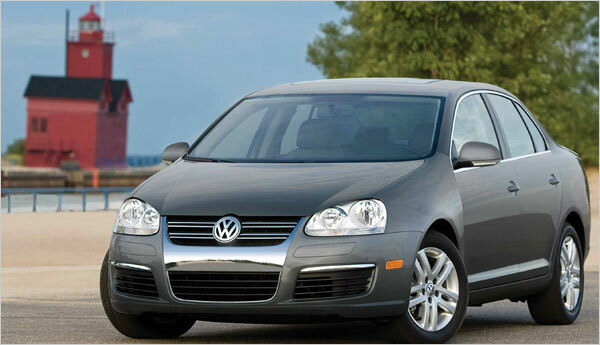 Volkswagen's target of increasing its North American sales removed the Jetta from the premium compact car market. This forced many cost-cutting measures to be made for the North American models, which include a lower quality trim material for the interior and the replacement of leather with leatherette as an optional seating upholstery. The North American version also loses the multi-link rear suspension of the previous generation. Engines from the MK5 Jetta carried over include the 170 hp 2.5 L (five-cylinder) as well as the economy-minded 140 hp 2.0 TDI (diesel) engine. A hybrid, 1.4 L engine mated to an electric motor will be available in 2012 due to hybrid popularity in North America. In North America, the base model (S in the US, Trendline in Canada) receives a dated 2.0-liter 8-valve four-cylinder engine with 115 horsepower and 125 lb-ft torque. Additionally, the intricate, space-saving, gas-strut trunk hinges used on the Mk III, Mk IV, and Mk V are to be replaced with less expensive gooseneck hinges that cut into available trunk space and can damage luggage. The Jetta GLI, a sedan version of the Golf GTI based on the new Jetta, will be revealed early at the 2011 Chicago Auto Show with the 2.0 TSI 200 hp engine and a fully independent suspension, as well as the European Jetta's soft touch materials. A black honeycomb grill, aggressive lower intakes, side adorning foglights, and smoked taillights are all elements to separate it from its run-of-the-mill counterpart. This model is also expected to be introduced in the European and other markets from 2011 onwards. The engine range for Europe is expected to comprise 1.2 TSI, 1.4 TSI (122 or 160 PS), 2.0 TSI, 1.6 TDI and 2.0 TDI engines. The European version will differ in some respects, particularly in having multi-link suspension at the rear. The European version will also incorporate soft-touch plastics on most of the dashboard (not the doors for this generation), and the rear seat center air vents have been restored. The sixth-generation Jetta went on sale on July 22, 2010 in Mexico, thus becoming the only country in the world where the fourth (as Clasico), fifth (as Bora) and sixth generation Jetta are available. A special edition named "Bicentenario" and approved by the Mexican government commemorates that country's 200th anniversary of the beginning of its war of Independence, on September 16, 1810. It is also the first car in Mexico with granted permission to use an official government logo (a "2010" plaque). Early speculation said the high performance version, called Jetta R, would be using a 2.0-litre turbocharged engine as same as Golf R and Scirocco R, but at the European introduction of the sixth-generation Jetta in October 2010, Volkswagen announced a planned Jetta R with a VR6 engine. The Jetta R uses a 3.6-litre VR6 engine, which enabled acceleration to 100 km/h (62.1 mph) in 5.5 seconds approximately. The engine power output was not revealed. 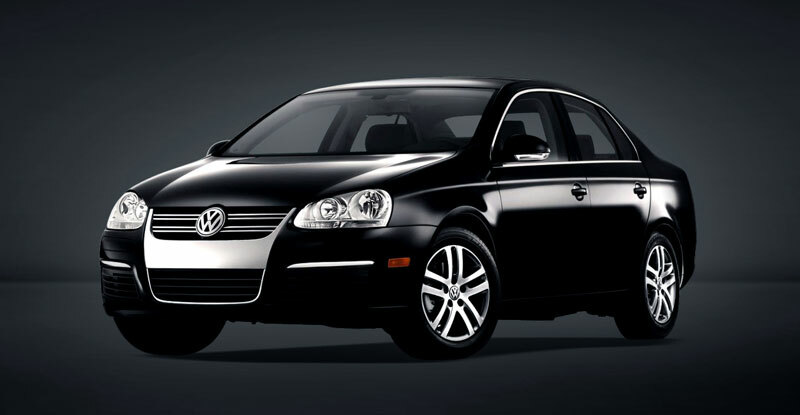 It has many distinguishing features over the other Jetta siblings, such as 'R' engraved stainless steel pedals, 'R' imprinted sport leather seats, Bi-Xenon headlights, 4motion all-wheel drive system, and quad rear muffler tailpipes. It will enter production next year if market demand is sufficient.